Like director Jason Reitman's last film, Thank You For Smoking, his teen pregnancy comedy Juno is smart, witty, unsentimental, and could probably be accused of being merely "quirky" by those less charmed by the film's carefully constructed edifices. The title character (Ellen Page) is a high schooler who gets pregnant after a night of fun with her best friend Pauly (Michael Cera). She's initially tempted by abortion, seemingly because it's the obvious option, but decides she can't go through with it and will put the baby up for adoption, settling on a childless couple (Jennifer Garner and Jason Bateman) who seem promising. It's a story rife with potential for weepy melodrama and pious moralizing from either the left or the right. Reitman, with the help of screenwriter Diablo Cody (best known previously for her stripper memoir Candy Girl), deftly sidesteps both possibilities, drowning out both sentiment and preaching with a barrage of wisecracks and non-sequitur jokes. The dialogue is a mishmash of pop culture references, a la Tarantino, and it seems stitched together from a series of deadpan one-liners, a la Chuck Palahniuk, but there's still something about the rhythms of Cody's writing that's distinctively hers, a wry sarcasm that looks at the world from just slightly askew. It's easy to see why this style would grate on some, especially since every character in the film speaks in the same voice, but I found it mostly charming and funny, aside from a handful of cringe-worthy exchanges that are mostly confined to the opening few scenes. It helps that the proliferation of wisecracking humor doesn't serve as a replacement for heart and emotion, which are sometimes hidden or submerged, but never eliminated. In one early scene, when Juno goes to tell Pauly that she's pregnant, she puts on the usual facade of sarcasm and affected posturing, even setting up a living room tableau on his front lawn as a prank, but it's obvious that she's nervous. And when Reitman inserts a closeup on her eyes, they're just slightly wet and soulful, while her mouth maintains the same wry smirk as she fakes smoking a pipe  the contrast tells us all we need to know about Juno and her barely controlled feelings without resorting to anything too sappy or showy. The film's more emotional moments are mostly quiet, and often risk silliness in order to achieve genuine pathos, like the scene where Garner, as the prospective adoptive mom, happens upon Juno at the mall and feels her stomach. 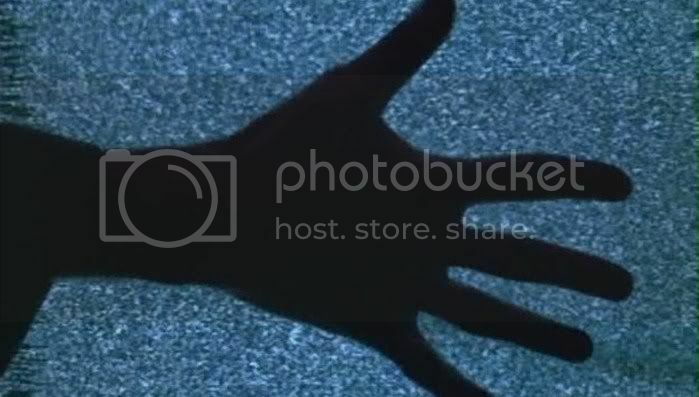 She kneels down, talking to the teen's belly, trying to get the baby to kick, and the scene is played entirely straight, stepping back from the obvious laughs in order to allow a sweet and moving moment to emerge from the awkward situation. It would be very easy for the film to mock Garner's needy, somewhat desperate character, but for the most part it doesn't, only poking gentle fun at her idiosyncrasies while treating her emotional state with respect. In fact, that respect is a hallmark of Cody's script. Her characters may all talk the same way, but their personalities are individuated at a deeper level, in their behaviors and their emotions, the things they want and think about. She's equally generous towards Bateman's character, even though in some respects he's the film's "villain"  he laments the relative loss of freedom that's accompanied his marriage, and doesn't feel ready for the added responsibilities of a kid. But his exchanges with Juno, though sometimes laced with a tangibly creepy undercurrent of attraction, are warm and funny, and draw him out him as a complicated individual rather than the irredeemable jerk he might've been. It also helps that the film is loaded with great acting, especially from the two leads. Page turns in a great performance, all bluster and sharp wit with a strong basis of vulnerability and emotional upheaval brewing underneath. Michael Cera seems to have settled into playing one character over and over, the same nervous, perpetually confused nerd he was in both Arrested Development and Superbad, but it's a great character and he unfailingly brings heart and awkward energy to the role. Juno is a lot of fun, a smart comedy that treats a serious subject with irreverent wit while never losing track of the deeper emotions and ideas linked to it. I'm a bit afraid that Juno's longevity may ultimately be about the same as Reitman's Thank You For Smoking, which was also sharp and witty and fun, and which quickly faded into memory not too long after I saw it. Both films share a concern with surfaces, with sarcastic repartee covering up deeper subtexts and feelings. In the earlier film, it was the double-talking swagger of cigarette spokesman Nick Naylor (Aaron Eckhart), which served to obscure the realities of cigarettes' effects. The cover-ups are more benign in Juno, where the heroine's hardened surface deflects the disapproving stares of her peers at school (who mocked her for her differences even before her pregnancy). 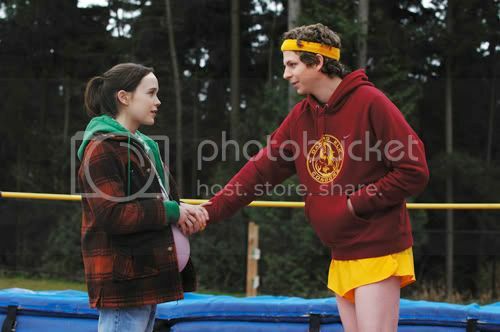 What Juno may have going for it, over Reitman's earlier effort, is its deeper involvement with its characters, the knowledge that heavily stylized banter and dialogue constructed almost entirely from one-liners can coexist with implied characterization and the subtlety of actors' gestures and expressions. This makes Juno a much more fulfilling experience than Reitman's last film, and by the end, it's even moving in spite of its nonstop wisecracking. Words cannot expres my antipathy to this propaganda pice. SHE SHOULD HAVE GOTTEN AN ABORTION!!!!! I can certainly understand that perspective on it, though personally I thought Juno's decision was handled pretty realistically. She obviously didn't make the wisest decision by not getting an abortion, but then confused teens often don't make the wisest decision, and usually for the silliest of reasons, like the fact that the clinic waiting room makes her uncomfortable and she's just been harassed by a protester. Regardless of whether you or I think she would've been better off getting an abortion, not every teen in that situation would do what we think best, and Juno makes a different choice. I don't think the film makes much of a judgment about abortion either way; the film isn't about that, but about Juno dealing with the consequences of the choice she makes. Anyway, it's no masterpiece but it was fun(ny) enough for a lightweight sarcastic comedy. And Page and Cera give great performances, balancing quirk against subtle pathos. The film is beuing lauded for the fact that its "wisecracking" heroine doesn't get an abortion. American hospitals are overflowing with unwanted children destined for miserable lives because of the right's anti-abortion propaganda. This film supports it in "hip" drag. I wouldn't really blame the filmmakers for the fact that the right could co-opt the film in that way. I don't think the film itself delivers any anti-abortion sentiment, and merely having a character choose not to get an abortion would hardly qualify it as propagandistic. After all, it's the choice that matters, even if the person making that choice is making what we'd consider a "bad" choice. I'm certainly pro-choice myself, but that doesn't mean it's encumbent on every film about a pregnant teen to have her get an abortion. Anyway, I don't want to defend the film too vociferously. It has plenty of problems, I just don't think this is one of them. And thanks for commenting, David, as always! "I wouldn't really blame the filmmakers for the fact that the right could co-opt the film in that way." And I would. It's the cinematic equivalent of shouting "Fire!" in a crowded theater.